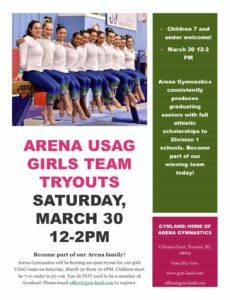 Arena Gymnastics consistently produces graduating seniors with full athletic scholarships to Division 1 schools. Become part of our winning team today! Children must be 7 years old or younger to try out. You do NOT need to be a member of Gymland. Please email office@gym-land.com to register.